I’ve never figured out what all the hullabalo is about White Asparagus. In France where there available in juicy fat spears they must be very special. But here even after 10 to 15 minutes in simmering water, I fiind that the spears are still stringy but the tips are good. I’ll keep up the search for that great Whites. Until then I’d rather have those juicy fat green spears that only require 5 to 6 minutes to be tender. 1. 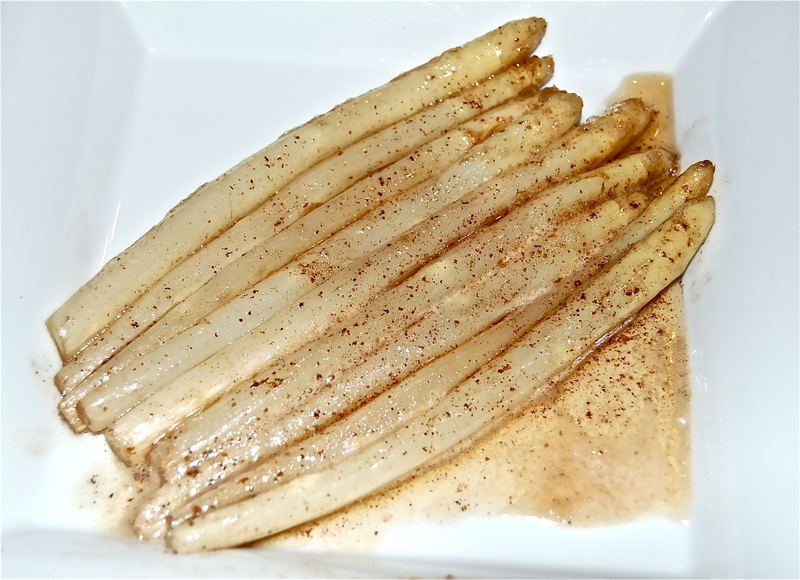 Cut 1″ off the ends of of the Asparagus. Using a vegetable peeler lightly peel the Spears. 2. Boil a pan of Water & add the Asparagus. simmer until they are tender when pierced with the tip of a knife. 10 to 15 minutes. Drain on paper towels. 3. In a saute pan heat the Butter until it turns brown & has a nutty fragrance. Add the Asparagus spears & allow them to be coated with the Brown Butter Sauce. Remove & plate.